Blur & Springsteen To Headline in 2009? Michael Eavis, who first staged the festival at his Somerset farm in 1970, is reportedly willing to risk charges that Glastonbury is becoming too middle class and middle aged by signing up a host of seasoned acts. Britpop band Blur, who announced they are to reform earlier this month, have also been mentioned as likely headliners, along with indie band Coldplay whose latest album Viva la Vida sold 500,000 copies within 10 days. Neither Bruce Springsteen, 59, nor Neil Young, 63, have played the festival before, but both would prove a huge draw for music fans. In June Springsteen performed a sell-out show at Arsenal's Emirates stadium in north London, and has sold 120 million records in his 40 year career. 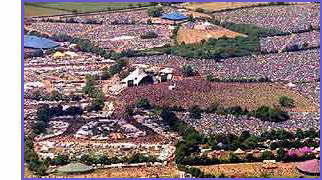 A Glastonbury spokesman declined to comment on the rumours, insisting that no acts have been 100 per cent confirmed. "It's the biggest festival of its type on the planet, so of course there will be all kinds of music," he told The Guardian. Jay-Z's performance this year won near-universal acclaim from critics, but music fans were divided about whether hip hop music has a place at the bohemian festival. Oasis's Noel Gallagher said Eavis had been "wrong" to book the rapper. ooooooooo, nice. not seen springsteen since the 'tunnel of love' tour... somewhere in the 80s! Blur are up there on my wish list.... crossed off the cure earlier this yr and so only nick cave left if damon, graham etc do the honours. The Springsteen rumours seem fairly solid, while it's almost certain Blur will play as they've not played there since 98, and the last big UK festival they did was Reading in 03 and that was without Coxon. Plus it was a rubbish gig.